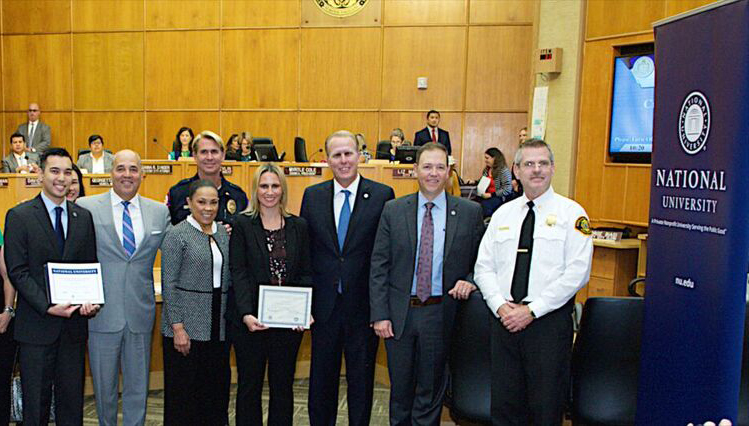 San Diego Police Department Dispatcher Danielle Schule (center) earned the 2017 City of San Diego/National University Professional Development Scholarship. Finalists included Jonathan Ferreras of the San Diego City Attorney’s Office (left), and firefighter Phillip Haughey (not pictured). San Diego, Calif. – San Diego Police Department Dispatch Supervisor Danielle Schule, who in her capacity has worked to support public safety for the past 15 years, has been named the 2017 City of San Diego/National University Professional Development Scholarship recipient. The scholarship will enable Ms. Schule to complete her studies at National University, and it is the result of an ongoing collaborative effort which three years ago led to National University becoming the City of San Diego’s designated Preferred Employee Education Program Partner. As the 2017 City of San Diego/National University Professional Development Scholarship recipient, Ms. Schule will receive a full scholarship to National University, one of the largest nonprofit universities in California. Ms. Schule is a dedicated public servant who recently trained more than 100 officers who volunteered to work with dispatchers to help reduce 9-1-1 call times. She also aspires to complete her master instructor program for POST – an acronym for Peace Officer Standards and Training – so she can teach POST classes to dispatchers. Ms. Schule was honored during an Oct. 24 San Diego City Council meeting along with two other finalists: Phillip Haughey, a firefighter who has served with the San Diego Fire-Rescue Department for the past 11 years; and Jonathan Ferreras, Operations Support Manager who has worked for the San Diego City Attorney’s Office the past nine years. As finalists for the 2017 City of San Diego/National University Professional Development Scholarship recipient, Mr. Haughey and Mr. Ferreras will receive $2,500 scholarships from National University. If they choose to pursue their education with National University, they will also receive $2,500 scholarships from California Coast Credit Union — for a total of $5,000 each. Ms. Schule, Mr. Haughey and Mr. Ferreras were chosen by a panel comprising City of San Diego and National University representatives for their demonstrated commitment to public service and giving back to the San Diego community. National University’s close collaboration with the City of San Diego underscores its commitment to supporting through education the communities it serves. As a result of the partnership, all City of San Diego employees receive a 15 percent reduction in tuition at National University and the chance to qualify for full scholarships. Previous City of San Diego/National University Professional Development Scholarship recipients include Nicole McNeil, a pool safety manager with the Parks and Recreation Department who won the award the first year it was offered in 2015. Ms. McNeil graduated this past June with a degree in Integrated Marketing Communications through National University’s School of Business and Management. Andy Lerum, a Marine Safety Lieutenant with the San Diego Fire-Rescue Department, earned the San Diego/National University Professional Development Scholarship in 2016 and is pursuing a degree in cybersecurity through National University’s School of Engineering and Computing.